INCLUDES COMPLETE KEG TAPPING KIT: This keg beer dispenser provides you with all of the equipment you’ll need to pour a cold, refreshing glass of beer straight from the keg, including a brand new 5 lb. aluminum CO2 tank, a single gauge CO2 regulator, 5 feet of 5/16 inch I.D. blue air line assembly with 2 snap clamps, D system keg couplers, and a 3″ diameter chrome plated metal two faucet draft tower. The CO2 tank ships empty and will need to be filled locally. LARGE INTERIOR: The interior of this keg beer refrigerator is spacious enough to easily hold any full-size keg, including Coors kegs, Miller kegs, and rubber kegs. It can also hold up to two 5 gallon D system kegs or up to three 5 gallon Cornelius ball lock home-brew kegs, allowing you to dispense more than one type of beer at a time. When you’re not using it as a beer dispenser, it can easily be converted into an all-refrigerator using the two included adjustable storage shelves. CONVENIENT DESIGN FEATURES: This Kegco kegerator’s convenient design boasts great features like attractive styling, a removable and easy-to-clean built-in drip tray, a chrome guard rail that helps prevent your mugs and glasses from sliding off of the countertop, and easy rolling casters that allow you to easily move the unit from one location to another. The casters lock once the unit is in position, so it won’t roll away again until you want it to. Style, convenience, and efficiency combine in this Kegco K309 Beer Keg Dispenser. This kegerator has rolling casters that allow it to be easily moved from room to room, and a sleek finish that will look great with any decor. Additional features like an easy-to-clean removable driptray and chrome safety guard prevent inconvenient messes, and a 25% more energy efficient design will save you money every month! Fan forced cooling circulates the air for even temperatures throughout unit. It features one of the coldest temperature ranges of any draft beer dispenser on the market, allowing it to be set as low as 32 degrees. Another convenient cooling feature on the K309 is the Deep Chill Function, which forces the compressor to work continuously for 24 hours to quickly cool down a warm beer keg. This Keg Beer Cooler can accommodate any full size Keg (including Rubber kegs, Miller kegs, and Coors kegs) thanks to it’s large interior. It can also fit up to two 5 Gallon D System Kegs or up to three 5 Gallon Cornelius Ball Lock Home-Brew Kegs. This keg refrigerator doesn’t only hold kegs: when you’re not using this versatile unit as a beer keg cooler, you can easily convert it into a regular refrigerator using the two wire shelves that are provided. These shelves can be placed far enough apart to allow you to store 2-liter soda jugs, gallon jugs, or even bottles of wine! 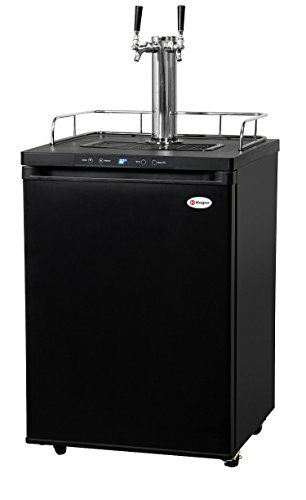 K309 Beer Keg Refrigerators from Kegco come complete with everything you will need to dispense a refreshing glass of your favorite cold draft beer. The Direct Draw Tap Kit includes all the necessary equipment to dispense a cold, delicious glass of beer. DESIGNED AND BUILT TO LAST: This Kegco kegerator has been designed and constructed using only high-quality components, ensuring superior long-lasting performance. The unit measures 33″ H x 23-11/16″ W x 23-15/16″ D, and all dispensing accessories are UL recognized components. A stainless steel interior floor mat evenly distributes the weight of your kegs to help prevent damage over time, and also allows your kegs to glide smoothly in and out when loading and unloading.